The Friends of Sunset Farm will have a booth again at the Horse Expo/ Draft Horse Spectacular! Look for us in the main aisle of the Washington Tractor Arena where all the action is... Hope to see you there! We will be raffling off a nice show jump including two 5' schooling standards, two 10' jump rails, two 4' wide x 1' high brush boxes and two pairs of jump cups. Only 125 tickets will be sold and they are only $5 per raffle ticket. Raffle will be held on Sunday afternoon... need not be present to win! UPDATE: The raffle jump was won by Robin Probst of Bellingham! Congratulations Robin! A huge "thank you" to volunteer Dawn Secontine-Hansen (pictured below) for manning the booth for most of the Expo. We couldn't have done it without you Dawn! 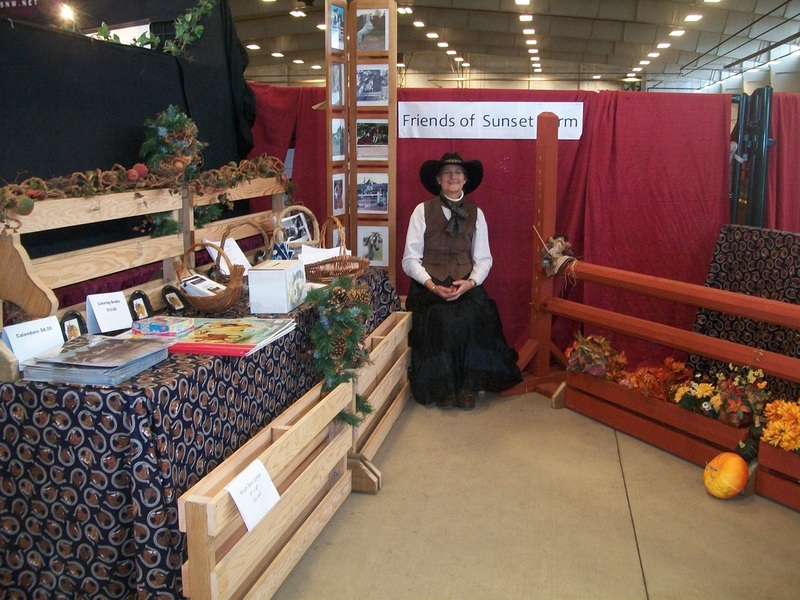 The Friends of Sunset Farm had a booth at the 2012 Horse Expo at the Northwest Washington Fairgrounds in Lynden. Hope you were one of the many folks that stopped by to visit FOSF President Roger Edmonds... we were in booth no. 52, just inside the Luft Trailers Arena (that is the OLD indoor arena for you locals). Looking forward to the Horse Expo next year, and hopefully signing up early will get us a booth in the main arena aisle where we'll have more exposure. Several members of FOSF participated in the Horse Expo as well, Heather Cruise was a demo rider in one the Greg Best sections, Andrea Heimer had a booth promoting her "Rollling Stone Equestrian" riding lesson business and Kimberly Barber of Orion Equestrian Training was one of the clinicians providing demonstrations throughout the weekend. What a great weekend of "horsing around"!